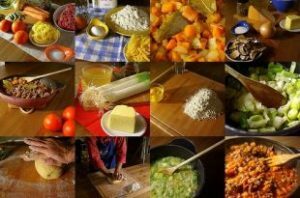 Ancient Roman Dining: For the majority of persons dining in Ancient Rome, meals were centered around corn (grain), oil and wine, and, for the wealthy, different types of exotic foods. Cereals were the staple food, originally in the form of husked wheat (far) being made into porridge (pulses), but later naked wheat (Frumentum) was made into bread. Bread was the single most often eaten food in Ancient Rome and was sometimes sweetened with honey or cheese and eaten along with sausage, domestic fowl, game, eggs, cheese, fish, or shellfish. Roman Legionaries followed a carefully supervised diet. Their diet was a balanced one of wheat, some meat (usually bacon), fish, poultry, cheese, vegetables, fruit, salt, olive oil, and wine. Wheatmeal porridge (pulse). Meat (pork, mutton, beef) was scarce except at sacrifices and dinner parties of the rich. Fish was more common. Fish and oysters were especially popular; meat, particularly pork, was in high demand as well. Elsewhere in Rome, delicacies, such as snails or dormice, were specially bred. 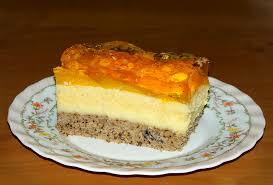 A variety of cakes, pastries, and tarts was baked commercially and at home, often sweetened with honey. Vegetables such as cabbage, parsnips, lettuce, asparagus, onion, garlic, marrows, radishes, lentils, beans, and beats were imported. Fruits and nuts were also available to the consumer, as was a variety of strongly flavored sauces, spices, and herbs, which became very popular in Roman cuisine. The diet of an average Roman consisted of cereals, olives, wine, as well as fruits and legumes like chickpeas and lentils. Fish was a luxury and rarely eaten, and the primary source of the meeting came from pigs. Cereals in the forms of bread and the porridge were a staple of Roman’s diet, as the monthly state distribution of free grain to the urban poor attests. The poor Roman Dining, mothers and young children were probably undernourished and, because the babies of well to do mothers were n9rmally given to wet-nurses and, hence, denied colostrums, they were particularly venerable. The Romans had no coffee, tea, sugar, liqueurs, truffles, potatoes, French beans, or even tomatoes. As the Romans had no sugar, sweets were made with honey or must (grape-juice). 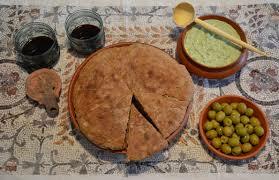 Olives and olive oil, as still with Mediterranean countries today, stood in high esteem. 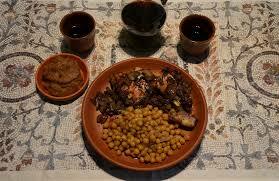 The most widespread vegetables were broad beans, lentils and chickpeas, lettuces, cabbages, and leeks. Food was transported into the city on wagons from suburban farms market-gardens an on barges form Rome’s port-city of Ostia; it was then distributed to markets throughout the city. For example, the Cattle Market was located at the foot of the Capitoline Hill and near the Tiber River. Since the cleanliness of these urban markets much has been marginal at best, there is to doubt that food contamination was a major problem, making intestinal parasites a common malady. For example, because of its proximity to the Tiber, the Cattle market was routinely flooded and, therefore, food was most likely contaminated on a fairly regular basis. The use of bread seems to have become general only at the beginning of the second century BC. Previous to this grain was used as pulse, a mashed up form of corn gruel.